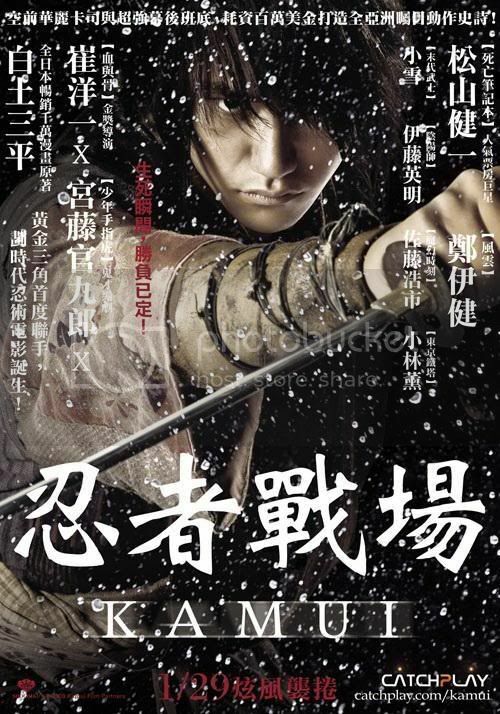 KAMUI (Kenichi Matsuyama) is a fugitive Ninja on the run from the world of Ninja bound by rules in search of true freedom. However, he burdens the fate to fight against the Ninja pursuers who try to kill him for betrayal. In order for Kamui to live, he constantly needs to fight. He does not trust, and he does not love. Showing affection will show his weakness and will lead to immediate death. However, when he meets a fisherman named HANBEI (Kaoru Kobayashi) and ends up saving his life, he eventually ends up staying with Hanbei’s family. SAYAKA (Suzuka Ohgo), the daughter of Hanbei falls in love with Kamui. It is the first time that Kamui had felt any feelings towards others and although he is confused with the sense of “life” which rises inside himself, he also has a strange chill at the same time. As fate has it, SUGARU (Koyuki), hiding herself as Oshika, the wife of Hanbei, turns out to be also a fugitive Ninja. She feels endangered by Kamui knowing the truth, and proposes a duel. While Kamui and Sugaru were fighting, Hanbei is caught by the LORD GUNBEI (Koichi Sato) for killing his beloved horse. With Kamui and Sugaru’s skills, they rescue him, earning trust for each other. The family and Kamui is on the run again, but now with the help of a Pirate & Shark Hunter leader FUDO (Hideaki Ito), they reach a remote island, and in return, Kamui agrees to help Fudo and his men to hunt sharks. Kamui’s skills attract Fudo, and they quickly become close. Fudo invites Kamui to become one of the crew. The charismatic Fudo and his men attract Kamui as well, who has wanted a place in life. However, all this had been a trap to kill Kamui. Fudo was a Ninja pursuer of Kamui. In order to corner Kamui, he cruelly kills all on the island, including Hanbei, Sayaka, and Sugaru.